Bold beats and folk icons, hand-crafted delicacies and gorgeous produce, unexpected art installations and an old-school working waterfront are all part of Clearwater’s Great Hudson River Revival, also known as the Clearwater Festival. This year’s festival takes place June 15 & 16, uniting major musical figures and green activism and building a creative community in Croton Point Park in Croton-on-Hudson, NY, one of the most scenic spots on the Hudson River. Founded by musical activist Pete Seeger and nurtured by over a thousand dedicated volunteers, the event embraces the changing, eclectic spirit of the Hudson Valley. In addition to Seeger, who will be performing with longtime collaborator Lorre Wyatt, this year’s lineup includes Hot Tuna (acoustic) & Steve Kimock, David Bromberg Quartet, Kris Kristofferson, Son Volt, Mavis Staples, Sharon Jones & the Dap-Kings, Keller Williams & The Travelin’ McCourys, Jill Sobule, Patterson Hood, Jason Isbell, Toshi Regan & Big Lovely, Ivan Neville’s Dumpstaphunk, The Lone Bellow, Tift Merritt, and The Last Bison. In addition to American roots music, the festival has long welcomed world music. This year is no exception, with Antibalas, Sierra Leone’s Refugee All Stars, Red Baraat, Vieux Farka Touré, Delhi 2 Dublin, and Native American artists Buffy Sainte-Marie, Joanne Shenandoah and Martha Redbone. The festival’s other guiding light is changing the way people relate to the river, and to the environment and community in general. The festival has an artisanal food and farm market, juried crafts fair, roving performers, traditional storytellers, an activist area, and a chance to ride on river craft like those that have traversed the Hudson for centuries. All in one two-day, zero-waste, bio diesel- and solar-powered festival, to support the mission of Hudson River Sloop Clearwater, Inc, one of the nation’s preeminent environmental organizations and a key mover in promoting policies to restore the Hudson to its former, teeming glory. The festival is celebrating its 35th anniversary in 2013. 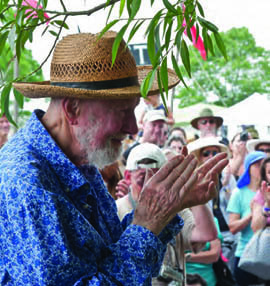 Seeger, still going strong at age 93, laid the first foundation for what has become the Hudson Valley’s biggest musical celebration and community-organizing focal point when, more than forty years ago, he looked at his beloved, once vital river and saw with dismay it had become a heavily polluted, half-dead sewer. Unwilling to let such a scenic, culturally important waterway decline further, Seeger and like-minded friends got together and raised enough money to recreate one of the sloops that once plied the Hudson. Unable to find an old ship to restore, they found a Maine shipbuilder who created the 106-foot sloop Clearwater and began changing the face of the river. They hoped the vessel would help bring locals back to their riverfronts, and help them see what had happened to their Hudson. Today the Clearwater sails at the forefront of environmental education, a floating classroom for youth and adults. The festival evolved from the sloop and its travels. What started as a boat journey with musical stops along the way eventually settled into a full-blown outdoor music and environmental festival. Over three and a half decades, it grew to embrace a unique balance of community spirit and hope – many local organizations do their briskest organizing and outreach during the two-day event – and top-quality performers. Yet the festival’s expansion did not smother its relaxed, open atmosphere, where a festivalgoer can join a community sing or see the river from a whole new perspective from the deck of the Sloop Clearwater or SchoonerMystic Whaler. Families are particularly welcome, with free admission for kids under 12. There’s a family stage, face painting and juggling, a hands-on musical petting zoo, and workshops to help young musicians build their own instruments from recycled materials. What unites festival participants, from farmers to volunteers to headliners, is a shared ethos. “We’re all working on the same cause and issues, and it never feels like it’s just a festival,” reflects Volpe. “I’ve never crossed paths with volunteers at other events who’ve had this same experience. It’s a very special relationship.” Visit ClearwaterFestival.org and Clearwater.org for more information. For festival tickets, call 845-236-5596.